Obviously, the Michigan Miracle (the name I'll forever give to the Wolverines' Sweet 16 win against Kansas) was all about Michigan's offense making just a few more plays than Kansas' down the stretch. However, it's clear the other two games vs. VCU (81.9 defensive efficiency) and Florida (83.8 defensive efficiency) were as much about the Wolverines' improving defense. Even in the Kansas game, where Kansas' offensive efficiency was a whopping 110.7 it was Michigan's defense down the stretch (and some clutch shot making and a few dominoes falling into place) that really gave the Wolverines a chance to win. 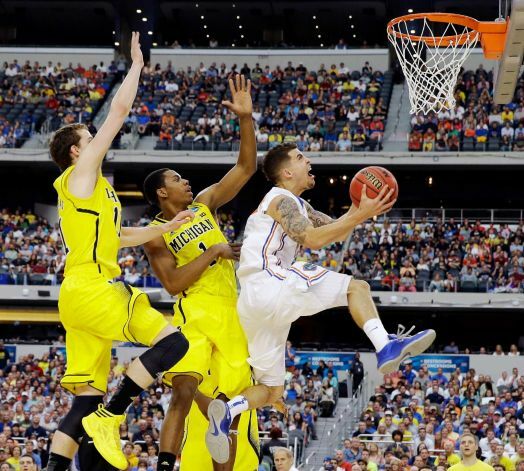 When Kansas took a 68-54 lead with 6:45 to play it appeared the dreams of a Final Four were gone. Instead, Michigan's defense came alive. During the rest of regulation Michigan outscored Kansas 22-8 by holding Kansas to 2-for-5 shooting from the field and forcing four turnovers (Kansas also went 4-for-5 from the free throw line). Yes, Kansas still shot 40 percent during that stretch, but compared to Kansas' 54.5 percent shooting for the game coupled with the fact there were four pivotal turnovers mixed in and the Maize and Blue defense rose to the occasion. When Michigan takes on Syracuse tonight the obvious "big-time" matchup will be Michigan's offense vs. Syracuse's vaunted 2-3 zone defense that is playing on another level right now. Nevertheless, Michigan's defense will be in the spotlight against Syracuse's offense. If Michigan can limit fast-break opportunities it's half-court defense matches up pretty well with the Orange, especially since if James Southerland isn't hitting his 3s it makes the Orange's offense much more average.